So-called 'activated water' is no more effective than tap water. Tennant's advertising claims regarding the cleaning power of an all-purpose cleaner that is water 'activated' using its ec-H2O technology, are deemed to be anti-competitive. This decision by the Stuttgart Regional Court in Germany is now legally binding and Tennant has withdrawn its appeal - two years after legal action was commenced by rival cleaning machine manufacturer Kärcher. "The evidence was overwhelming. We were always confident that the facts would prevail in the end. With the withdrawal of the appeal the court's decision is now legally effective: ec-H2O cleans no better than tap water," says Markus Asch, deputy chairman of the management board of Kärcher. "The court decision is a success that benefits all customers. Competitive cases such as this one create confidence and trust." Tennant is now required to bear all the costs of the proceedings. Heidi Wilson, Tennant Company general counsel and secretary said: "Tennant Company has not altered its position that the decision of the German court is, respectfully, based on incomplete and inaccurate information. “The withdrawal is for purely commercial reasons as the case was primarily about advertising claims that are no longer being used by Tennant,” Wilson continued. “Tennant maintains that the two laboratory bench tests performed by the court-appointed advisor were seriously flawed. The first test had no applicability to Tennant’s ec-H2O chemical-free technology as the test is typically used to measure properties in traditional chemical cleaners. The second bench test, which involved a soil of concentrated fats, has little correlation to cleaning with any scrubber dryer, regardless of the cleaning solution being used,” explained Wilson. “There is no standard for performance testing in our industry. Real-world operation remains the test that truly matters and our customers are the true judges of performance,” Wilson continued. “Tennant customers who have chosen to effectively clean their facilities with reduced chemical usage are satisfied with the performance of ec-H2O. And for those who wish to see results for themselves, we invite them to a free demonstration of ec-H2O performance on their facility’s specific soils,” said Chris Killingstad, president and ceo of Tennant Company at the US headquarters. Tennant Company introduced its proprietary ec-H2O technology in 2008, which is based on the process of electrolysis. As of the end of 2012 the company says it had more than 4,000 ec-H2O customers across the globe, 40,000 ec-H2O scrubbers in the marketplace and 329 million euros cumulative ec-H2O sales. As I've always believed and said if you want to clean with water any scrubber will do that, why pay more for something if you don't need to. US demand for janitorial equipment and supplies (excluding chemical products) is forecast to advance 1.7 percent per year through 2017 to $7.2 billion. Although not rapid growth, this rate will be an improvement from the more sluggish gains of the 2007-2012 period. Sales of many of these products declined from 2007 to 2009 due to the recession and its subsequent effect on business activity levels, when a large number of businesses delayed replacing or upgrading higher cost janitorial products and decreased the frequency of nonessential cleaning services. However, many businesses began purchasing new equipment between 2010 and 2012 as the economy improved, helping sales of most products return to pre-recession sales levels. These and other trends are presented in Janitorial Equipment & Supplies, a study from The Freedonia Group, Inc., a Cleveland-based industry market research firm. Among markets, institutional buildings will post the fastest gains through 2017. This market will see the most rapid growth in floor space due to an increase in the number of health care and related establishments. In addition, these locations have a particular interest in higher value products that can reduce the risk of cross-contamination and maintain indoor air quality, such as disposable microfiber flat mops, no-touch cleaning equipment, and automated cleaning products with advanced particle filtration features. The residential market will also see above average gains as homeowners return to more frequent use of contract cleaners who employ these commercial grade products. Manual cleaning products are forecast to experience some of the fastest growth through 2017, attributable to a more delayed recovery from the effects of the recession, as well as ongoing product development. For instance, sales of products such as wipes, cloths, and flat and wet mops will benefit from the continuing adoption of higher value microfiber, which requires minimal use of chemicals and lasts longer than standard products. 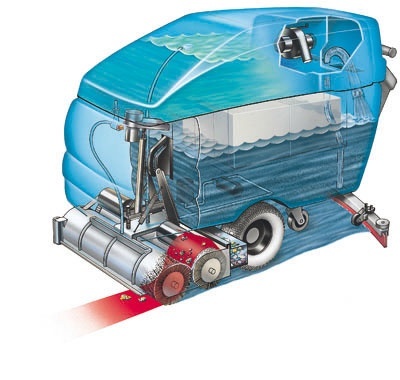 Sales of multipurpose automated floor cleaning machines will benefit from renewed demand for automated floor cleaning machines, as businesses that delayed replacing or upgrading machinery during the recession will be attracted to the possibility of replacing two or more machines with a single multipurpose product. A little known fact, Oct 2 is National Custodial Appreciation Day. A day to remember the hard working individuals that you may never see. You leave at the end of each day after having worked, eaten and drank coffee at your desk, thrown that banana peel in the garbage and in the morning everything is clean once again. Why is this day important or these people important to your workplace? Have you ever considered what would happen if no one were to clean your facility for 1 day, 1 week, or 1 month? Garbage would pile, floors would be black, sticky, and maybe even slippery. The worker who came in with the cold, well now the whole office or facility has had a cold not just a small percentage, because no one disinfected after them. The smell of the garbage would a little much to bear, no one wants to use the washrooms and the dust would be everywhere causing allergies to be worse then ever. Yes our Custodians work hard and do something that we don't see. So today on this day buy them a coffee, tell them Thank you for the hard work and show your custodian you appreciate them and their hard work. Thank you all custodian for the hard work and dedication. Phil-T "Nothings too filthy for Phil-T"